In this article, we present a decentralized convention formation framework for creating social conventions within large multiagent convention spaces. We study the role of the topological characteristics of the network in forming conventions with an emphasis on scale-free topologies. We hypothesize that contextual knowledge encapsulated in the topology can help improve both the quality of the emergent convention and the speed of forming such a convention. We also investigate the influence of network diversity. While recent research on diversity indicates that it improves organizational productivity, we observe that not all diversity is equally useful and identify the necessary conditions to maximize the benefit of diversity. We validate our convention formation framework using a language coordination problem in which agents in a multiagent system construct a common lexicon in a decentralized fashion. Agent interactions are modeled using a language game where every agent repeatedly plays with its neighbors. Each agent stochastically updates its lexicon based on the utility values of the lexicons received from its immediate neighbors. We introduce a novel context-aware utility computation mechanism and equip the agents with the ability to reorganize their neighborhood based on this utility estimate to expedite the convention formation process. A key idea behind our approach is the ability of socially influential high-utility-lexicon agents to bias their neighbors towards accepting their lexicons. Extensive experimentation results indicate that our proposed solution is both effective (able to converge into a large majority convention state with more than 90% agents sharing a high-quality lexicon) and efficient (faster) as compared to state-of-the-art approaches for social conventions in large convention spaces. We thank Professor Sherief Abdallah for his contributions towards our initial investigations of scale-free networks. We also thank the two anonymous reviewers for their insightful comments. Li, S., & Chen, Z. (2010). Social services computing: Concepts, research challenges, and directions. In Proceedings of the 2010 IEEE/ACM international conference on green computing and communications & international conference on cyber, physical and social computing, ser. GREENCOM-CPSCOM ’10 (pp. 840–845). Washington, DC: IEEE Computer Society. https://doi.org/10.1109/GreenCom-CPSCom.2010.122. Salazar, N., Rodríguez-Aguilar, J. A., & Arcos, J. L. (2010). Self-configuring sensors for uncharted environments. In Fourth IEEE international conference on self-adaptive and self-organizing systems, SASO 2010, Budapest, Hungary, 27 September–1 October 2010 (pp. 134–143). https://doi.org/10.1109/SASO.2010.38. Nowak, M. A., Plotkin, J. B., & Krakauer, D. (1999). The evolutionary language game. Journal of Theoretical Biology, 200(2), 147–162. http://www.isrl.uiuc.edu/~amag/langev/paper/nowak99theEvolutionary.html. Salazar, N., Rodriguez-Aguilar, J. A., & Arcos, J. L. (2010). Robust coordination in large convention spaces. AI Communications, 23(4), 357–372. http://dl.acm.org/citation.cfm?id=1898063.1898068. Girvan, M., & Newman, M. E. J. (2002). Community structure in social and biological networks. Proceedings of the National Academy of Sciences, 99(12), 7821–7826. http://www.pnas.org/content/99/12/7821.abstract. Lancichinetti, A., Kivelä, M., Saramäki, J., & Fortunato, S. (2010). Characterizing the community structure of complex networks. CoRR. arXiv:1005.4376. Marchant, J., Griffiths, N., & Leeke, M. (2015). Convention emergence and influence in dynamic topologies. 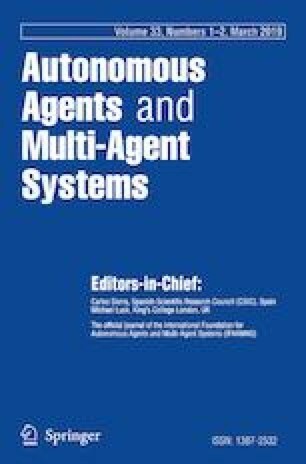 In Proceedings of the 2015 international conference on autonomous agents and multiagent systems, ser. AAMAS ’15 (pp. 1785–1786). Richland, SC: International Foundation for Autonomous Agents and Multiagent Systems. http://dl.acm.org/citation.cfm?id=2772879.2773436. Savarimuthu, B. T. R., & Cranefield, S. (2011). Norm creation, spreading and emergence: A survey of simulation models of norms in multi-agent systems. Multiagent Grid Systems, 7(1), 21–54. http://dl.acm.org/citation.cfm?id=2019196.2019199. Gkantsidis, C., Goel, G., Mihail, M., & Saberi, A. (2007). Towards topology aware networks. In INFOCOM 2007. 26th IEEE international conference on computer communications, joint conference of the IEEE computer and communications societies, 6–12 May 2007, Anchorage, Alaska, USA (pp. 2591–2595). https://doi.org/10.1109/INFCOM.2007.327. Ugander, J., Karrer, B., Backstrom, L., & Marlow, C. (2011). The anatomy of the facebook social graph. Computing Research Repository (CoRR). arXiv:1111.4503. Mitra, C., Kurths, J., & Donner, R. V. (2017). Rewiring hierarchical scale-free networks: Influence on synchronizability and topology. Computing Research Repository (CoRR). arXiv:1707.04057.